We produce agricultural machines for you. You can rely on our products for their reliability, high quality components and proven technology. We have been producing agricultural machines for almost 40 years and are driven by experience and passion, whilst we focus on the needs of farmers! We invite you to get to know our products which are the highest quality and we honestly believe that they will more than meet your expectations! We started with the production of a muck-spreader and later we developed the slant wagon (T183 /1). 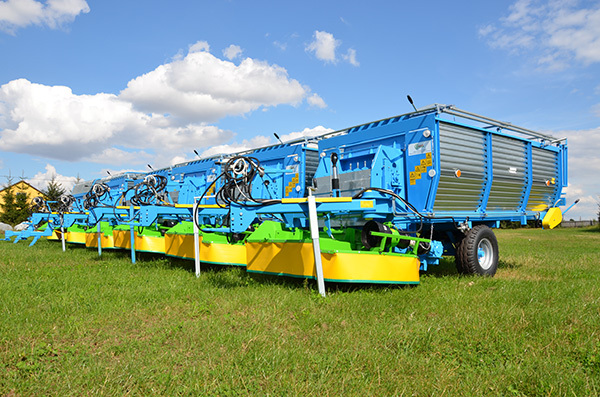 Another successful product of ours is the header-cutter-pick up to collect grass and herbs: mint, spinach, parsley etc.. The Hiller (P427 ) is another agricultural machine in our range – which is very popular among many of our clients. Our most recent addition to our range is the feeder-wagon; Fider – we hope you will be very pleased with it..
We focus on high-quality, modern technological ideas, your satisfaction and pleasure from the use of our best products!